Hi, my name is Bobby. | Are you drowning or waving? Hi, my name is Bobby. 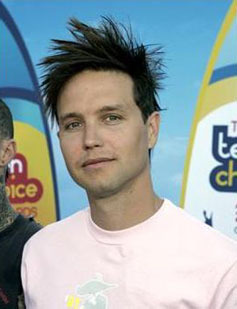 I’ve been thinking a fair bit on it lately, and I’ve decided that Mark Hoppus is my new hero. Mark is the bass player for +44 and the former Blink 182, and owns a couple of companies, Atticus Clothing and Macbeth Footwear, and in addiction has a hand in running Loserkids.com and Famous Stars And Straps. With a wife and a 5-year-old son, and a lot on his plate, he’s clearly keeping busy. Here’s the thing: Mark is 35 years old. I bet you no one gives Mark any guff about still being a punker into his 30s. So why the hell can’t I ride a train into the city wearing my Fall Out Boy shirt and listening to Marianas Trench or something on my iPod without some younger kid trying to make me feel old? I’m only 25, here, kids. Tell it to Mark Hoppus, my new hero. You rock on, Mark. Rock on hard.